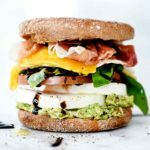 Customize this sandwich by adding or subtracting ingredients for a quick weekday breakfast or fancier weekend fare. Toast the English muffins. For each English muffin sandwich, drizzle one half of the English muffin with flaxseed oil or olive oil. Spread 1-2 tablespoons of the mashed avocado on the other side of the muffin then layer with 2-3 slices of mozzarella, 3 slices of tomato, and drizzle with the balsamic glaze and sprinkle with kosher salt and pepper. Top with one egg and the prosciutto and sprinkle with fresh torn pieces of basil leaves. Top with the other English muffin half. Serve warm, chilled, or at room temperature. You can make these sandwiches ahead and wrap tightly in plastic wrap and refrigerate for up to 3 days.